Bath water warm water, endless visibility, beach or boat access, fish, sea lion, rays, shark … with all of this available at tons of snorkel and dive spots, what are you waiting for? Dive San Carlos! 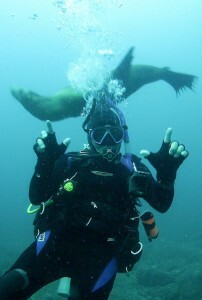 San Carlos Mexico has great diving in the Sea of Cortez. The shores of San Carlos offer many opportunities for divers (free and scuba) with a variety of interesting diving sites, training classes, and rental equipment. Contact one of the many local dive shops for information on renting dive equipment and to arrange a guide and boat tour. The snorkeling in this area is excellent, with many coves, arches and rocky outcrops to keep you busy. You will see a ton of starfish, eels, octopus and different colored fish (including sergeant majors and angel fish). Contact one of the many local dive shops for information on renting snorkeling equipment (fins, mask, snorkel, life jacket). Staying warm and comfortable begins with having the right exposure protection and a good fitting suit. Around here, we’re talking at least a full 7 mm wetsuit together with a set of 6.5/7 mm boots, 5 mm gloves and a 6.5/7 mm hood. List of common and exotic shells found in San Carlos Mexico. Interesting Marine Life also comes in small packages in the Gulf of California (Sea of Cortez). Discover the variety, shape and color of these shells … you can find them all while diving, snorkeling and walking the beaches in San Carlos Sonora. Diving the wreck of Poseidons Mistress which sunk in hurricane Juliet in 2001. The wreck is located 47 miles north of San Carlos, Sonora Mexico. This is a beautiful little cove with great snorkeling & scuba up and around both points. It’s fun to frolic in the water under the watchful eye of Tetakawi. Snorkel, dive, kayak and boat to explore the islands, arches and underwater treasures. Isla Pastel is located across from Condominios Pilar and the mouth of the estuary. Check out this video features cliff diving and snorkeling at Punta Cuevas. This cove is also an excellent place to kayak and scuba dive. Punta Cuevas is the point that juts out from the beach at the Marina Terra beach club.